During the meeting, the meditations given by Brother Alois at the end of each evening prayer are published on this page. (In German) Let me begin by saying a few words to the Germans and the German-speakers. I would have preferred to say what I have to say in German, since it is my own language. But so that the majority can understand and so that their ears are not tired out by always hearing the same voice, it is better that I speak English and a brother translates into German. (In English) For the first time, one of our European meetings is being held in Berlin. Already on this first evening, we want to thank all those who are welcoming us so warmly: the parishes, and so many families and individuals who have opened their doors. A special thank you to those who have decided to host young people even though they are not members of a church. Hospitality is one of the great contributions to build peace. Berlin is a city marked by the greatest diversity, a city always looking toward the future but also seeking to integrate the memory of a painful past. The drawing of the Virgin Mary with the infant Jesus that we see in every prayer hall was made during World War II by a German soldier at Stalingrad in Russia. To celebrate Christmas Eve he made that drawing on the back of a military map. That drawing is now here in Berlin, in the Gedächtniskirche, the church left in ruins as a reminder of the Nazi period. Did this soldier – we know that he was a Protestant believer – want to shout out his thirst for life and peace in the midst of the worst darkness of war? 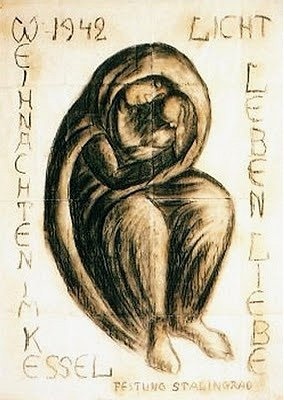 We do not know, but we can be touched in the deepest part of ourselves by this drawing, which is known as "the Stalingrad Madonna." Brother Roger came here in 1986 for a stage in the "pilgrimage of trust" in East Berlin. Permission to have a prayer with young people was granted on condition that no participants come from the West. Those days are over and Berlin is a symbol for all those who, across the world, try to cross dividing-walls to spread trust. Walls exist not only between peoples and continents, but also very close to us, and even in the human heart. So, in order to break down these walls, these days we are trying to draw new vitality from the wellsprings of trust. No human being, no society can live in isolation, without trust. That is why, beginning tomorrow morning, in the groups, you will look for ways of opening new paths of trust. Choosing trust does not mean turning a blind eye to evil. Trust is not naive or facile; it is a risk. We cannot take the risk of trusting alone. We need to be supported by others, to know that we are accepted and loved. Then we can take the important decisions in our lives more freely. These decisions are not rooted in fear or in mere emotions, but in this conviction: happiness is not found in the mentality of "everyone for themselves"; happiness is found by taking solidarity between people into account. At Christmas, Christ became one of us and left us, as a legacy, a new solidarity that is as vast as the whole human family. And we feel the responsibility which that legacy entails. With the Letter for 2012, I would like to encourage all those who read it to become more aware of human solidarity and to put it into practice to a greater degree. When we experience solidarity with others nearby or far away – the experience of belonging to each other, of depending on one another – our life becomes meaningful. At a time when many are wondering "what is the true meaning of my life?" we, the brothers of our community, would like to say it clearly: it is found in solidarity with others, lived out through concrete acts. Such solidarity allows us to glimpse that there is a love that is beyond us; it leads us to believe in God’s love for every human being. These days we are trying to practice this solidarity. Together we express as well our gratitude to all those who give their lives in humble service, in our families, in social work or politics, by a church commitment, and also by art. Yes, we all want to be one of those people, and in that way find joy. Last night I told you that trust between people is one of the values most needed to find new forms of solidarity. During these days in Berlin, we would like to support each other to root this conviction in trust in God. Trust in God is linked to an inner struggle; it is not automatic. So has the time not come to ask this question in a new way: what does it mean to believe in God? The communion we are given to live these days leads us to ask this question. That is the question you will reflect on tomorrow in the groups: what does trust in God mean? In Jesus, God comes towards us. He seeks to be close to every human being. I would love for all of us to feel this closeness these days in a new way. But how? Should we not rather recognize that we feel nothing, or very little, of God’s presence? Yes, that is true for many. Or it is true at certain times in our lives. But we should not stop at this discovery. We need to go deeper. How? you ask me again. To welcome God’s presence in us, we are not left solely to our feelings. God calls upon our ability to trust, even if it is very limited. In practical terms this can mean: to take times when we put our worries in the background, to create a kind of inner space into which God can come. Even if we only feel a void, the Holy Spirit comes, and imperceptibly trust in God can grow in us. This means giving up the image of a God who always fulfills our immediate needs. And that can be hard for us, especially when we have to deal with the meaninglessness of suffering. The Gospel asks us to make a demanding leap, a radical reversal of the image we have of God: recognizing that God has become vulnerable, that is to say that he needs to be loved. His love for us contains the question: "And you, do you love me?" By telling us that our love matters for him, God recognizes the greatness of our lives and our freedom. Thus, even to the most deprived human being, God restores his or her dignity; God does justice to him or her. We can all express our love for God, perhaps not with lofty sentiments or extraordinary thoughts. But we can be quiet and simply say to God, "You know I love you, I want to trust in your presence." In prayer there is always something of heaven and earth coming together. Perhaps we do not feel the immediate impact of such moments of prayer. But God gives us the Holy Spirit and the life of God in us can sprout, grow and inspire our thoughts and actions. In this way, we allow our human relationships to be determined more and more by the love God has for us and not by fear or defensive reactions. The trust God places in us becomes a radiant goodness for those entrusted to us, the source of a life in solidarity with others. Solidarity cannot stop at our door. That is why these days we are doing something all together for the people of North Korea. For the last fifteen years we have been able to undertake a regular humanitarian action from Taizé for that divided country we care about so much. Thank you to all those who have brought medical devices or medication that we will send to hospitals in rural areas through the Red Cross in Pyongyang. The Gospel reminds us that Christ is in solidarity with the poor. In the hungry, the ill or the abandoned, he is waiting for us. Prayer opens our horizons. God can, at the heart of the contradictions of life, light a flame of hope and joy. Such prayer brings us closer to God and changes our view of the world. May the love of God touch us to such an extent that our life becomes a life for others. These days we are searching for new forms of solidarity. Together in Berlin from all over Europe, we are attempting to give a clear sign that we want an open Europe, a Europe of solidarity, and that we support the reforms needed to get there. Faced with the extremely rapid changes of our societies, given the uncertainties and the economic hardships, we need to remember that the "economic", as important as it may be, is not the measure of man. We must affirm that the spiritual dimension is fundamental to human beings, that the dignity of every human being requires infinite respect. We are grateful for the many messages we have received. The United Nations Secretary General Ban Ki-Moon wrote: "I am especially encouraged that you are focusing on the search for new forms of solidarity. You have a crucial role to play to drive political and social change. But please remember that being connected is not the same as being united. Being connected depends on technology – being united depends on solidarity. Solidarity must be the foundation for global solutions." The experience of communion that is given us these days makes us ask: how is it possible for us to live out this communion, coming as we do from such different horizons? Is not this communion a sign that the Gospel message is not a dead letter, but a source of new life that comes from Christ? Christ is alive today. Without imposing anything he remains alongside every human being. He is the one who brings us together. To express by our lives that Christ brings us together in the love of God is the reason our small Taizé Community exists. Brother Roger was imbued with a passion for communion. Trust in God, in Christ and in the Holy Spirit, was for him inseparable from a search for reconciliation and peace between human beings. Tomorrow morning in the groups, you are going to ask what that can mean for you. The Church is not a society apart. Christ sends those who believe in him into the world, to be a leaven of trust and peace, to be salt of the earth. In this sense Brother Roger spoke of the "Christ of communion." So how can we perpetuate the scandal of division among Christians? Things have come to the point that we no longer even feel that our divisions are a scandal! Diversity will always exist between different spiritualities and traditions. But our resignation goes so far that we take this diversity as an excuse not to look for visible unity. The second half of the last century saw great strides towards the reconciliation of Christians. We do not now want to come to a standstill and remain on parallel paths. With determination we want to make every effort to achieve the visible unity of Christians. This means going toward each other to make possible an exchange of gifts: discovering the best that God has placed in others. This also means doing all we can together. Together we can do much more than we think. This means above all praying more together. Coming together more often for prayer vigils is already a way of anticipating unity and letting the Holy Spirit unite us. This may well also enable the theological dialogue to move forward. Inspired by this search, our pilgrimage of trust will not come to an end in Berlin; it will continue. Among the next stages, smaller ones or larger ones, I would now like to mention four. The third international meeting of young people in Africa will be held from November 14th to 18th in Rwanda, in Kigali. It is essential to find a new solidarity between Africa and Europe, a true partnership, a mutual listening. Rwanda still bears the traces of genocide, but the country is being rebuilt and is discovering a new dynamism. A Taizé each week there will be days of preparation for those who wish to attend this meeting in Kigali. On March 2nd, with an international group of young people, we will pray with leaders of the World Council of Churches, which brings together hundreds of Orthodox, Anglican, Protestant and United Churches. This will take place in Geneva. To learn more about the Orthodox Church after last Easter’s pilgrimage to Moscow, we will go with young people from different continents, from January 3rd to 6th, 2013 to celebrate the feast of the Epiphany with the Ecumenical Patriarch Bartholomew of Constantinople and with the Christians of the city of Istanbul. And finally, where will our next European meeting be held? This time, we are expected in southern Europe. A year from now, from December 28th, 2012 to January 2nd, 2013, we will go to Italy, to the city of Rome. We have with us tonight the secretary general of the diocese of Rome, Monsignor Mancini. And in the message we received from Pope Benedict XVI there are these words: "The Holy Father wants to tell you of the joy he will have in welcoming you next year for the 35th European meeting of your ‘pilgrimage of trust on earth.’ Rome will welcome you warmly!" By our meeting in Berlin, bringing together young people from all over Europe as well as from other continents, we are expressing our belief that new forms of solidarity are possible. We thank all those who have made it possible for this meeting to be full of joy and hope: the hosts who opened their doors in order to welcome guests, the parishes with their pastors and priests, the political leaders of the country and the city, those who supported the meeting by working even during the holidays, and also the young volunteers who came ahead of time to help prepare. Faith is not a refuge from the world; Christ sends us into the world. By trusting in him we acquire a taste for risks and the motivation to take on responsibilities. The turmoils of the global economy question us. Growing inequalities, even within wealthy societies, as well as the uncontrolled exploitation of the planet’s resources are sources of conflict for tomorrow. They represent a heavy burden for future generations. It would be irresponsible not to see this. The solutions will not only be technical ones. The upheavals of our time call for a change in the way we live. Many people today sense in themselves this question: what is the meaning of my life? For our common future, the sharing of material goods is a must. In affluent societies we will probably have to learn to be satisfied with less. That involves seeking personal development in relationships with others more than in accumulating material possessions. This requires sacrifices. But is there any real freedom, is there any strong and lasting happiness, without giving things up? Brother Roger often said: "We cannot create when things are too easy." Tomorrow we will return to our home countries, to our daily lives. I would like to make this appeal to you young people: continue the search you have begun during these days. Yes, let us continue to work together and to share our experiences. So that as many young people as possible can be listened to, we will hold meetings on every continent. In the coming year, at Pentecost, there will be one in Chicago, then, as I told you last night, in November in Kigali. During this first year we will reflect more specifically on the question: "How can we open ways of trust among human beings?" Three years from now, in August 2015, we will hold a gathering for solidarity in Taizé, to bring together what we have discovered and gain new momentum. Living in solidarity is first of all an inner attitude. For some of you, moments of silence and prayer may become more essential. 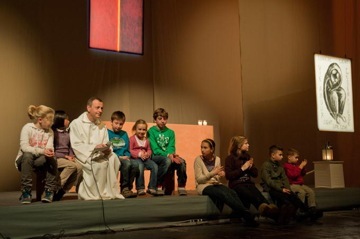 At Taizé we are organizing more opportunities for times of retreat. In front of you, in each of the halls where we are praying, a small light is lit in a lantern. The flame came to us from far away, directly from the Grotto of the Nativity in Bethlehem. That is the flame we passed to each other at the beginning of the prayer this evening. It is a kind of flame of solidarity that we cannot keep for ourselves alone. It will grow larger when we return home, to the extent that we share it with others. We brothers just want to be present, in Taizé or in the places where we live on different continents, persevering in our community life and prayer. By our presence we would like to be among those in whom you can always find support in your search for trust. And now we need to sing again. Singing to God, Christ and the Holy Spirit, right now with a song, and also tonight and tomorrow morning in the parishes, singing so that we are enabled to be, in the places where we live, witnesses to his peace and light.